A unique and thought-provoking view of what it is like to care for someone with bipolar disorder. It focuses on the importance of friendship alongside mental illness but also above and beyond this and everything else – it’s about the journey. This book is a fantastic insight into the complex interplay between physical and mental health problems, and is unlike anything I have read before. 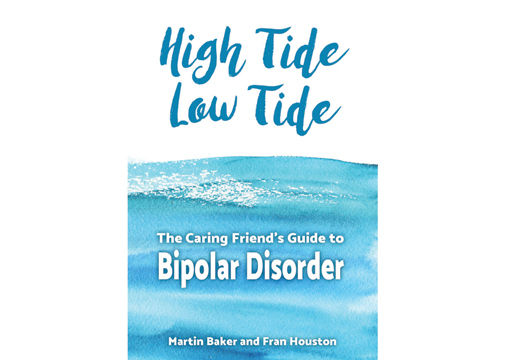 Marty and Fran’s account is brutally honest and takes you with them through their experience of mental illness, caring, friendship and so much more. It faces the issues of mania, depression, pain, fatigue and suicidal thoughts head on. It’s an insightful read for all, including students and anyone studying psychology. It will give you a wider perspective of mental health, mental illness and life in general, and it leaves the technical jargon at the door! The three main themes running through this book make a great ethos for living by – ‘Be yourself’, ‘Be there’ and ‘Celebrate the positive’. It contains useful tips on non-judgemental listening, the power of communication, contact and support. It focuses on the importance of boundaries and humour to foster successful relationships. It is somewhat repetitive in places, but only to emphasise the importance of friendship, and it shows that there is always hope. Chapter 3 focuses on wellness as a lifelong journey, something we can all relate to. It explores the complexities of self-management and the balance between mental illness, physical health, sleep, exercise, nutrition and links to mood and medication. Within this it explores these factors in relation to managing a severe and enduring mental illness. Chapter 7 is a striking chapter on the S-word focusing on suicide stigma and shame. Part 3 of the book includes an in-depth exploration of travelling, and a journey through mental illness and friendship. With a writing style that is personal, friendly and empathic, you feel like you are part of this unique friendship. This book has not only enhanced my understanding of bipolar disorder and recovery, it has given me personal insight into self-management for mental health and wellbeing.